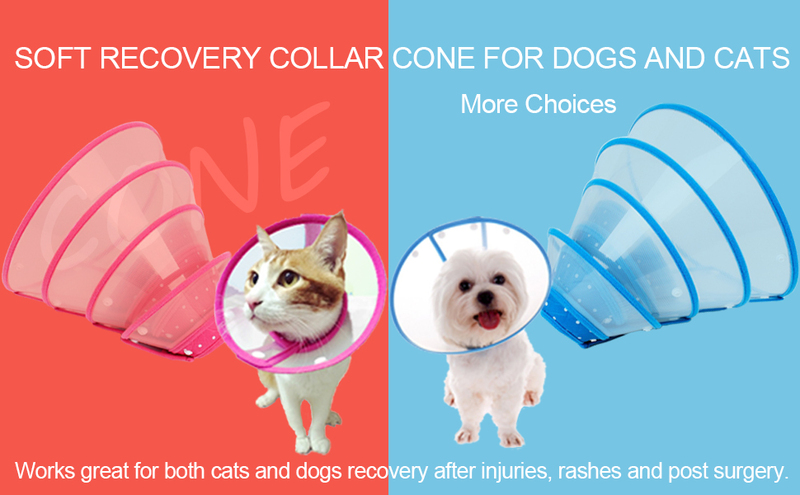 · Perfect protection: The dog cone is a safe and humane method of preventing animals from aggravating a healing wound or injury. Helps to overcome lick-bite, Itch-scratch cycle. Ends self-Inflicted wound aggravation or mutilation. · Comfortable: PP and Polyester fabric material, lightweight, transparent plastic having linear structure and built-in padded inner liner, extra soft fabric edge for additional comfort and protection. · Unique button closures easy to tighten or loosen. · With this plastic Snap Closure for safety fixing so most pets won't be able to bend it over. · Pets rest more easily as the soft fabric edge lets them lay their head comfortably in any position. · The size in inches from the neck to the snout. · The measurement (neck to snout) is the most critical, as the collar needs to extend beyond the nose in order to provide effective protection. · If any of the measurements are 'between' two sizes, choose the larger size.